We spent over 72 hours researching and testing 10 different brands and several types of dental floss and found that ease of use, brand name, and flavor were the most important factors that consumers looked at when shopping for dental floss. 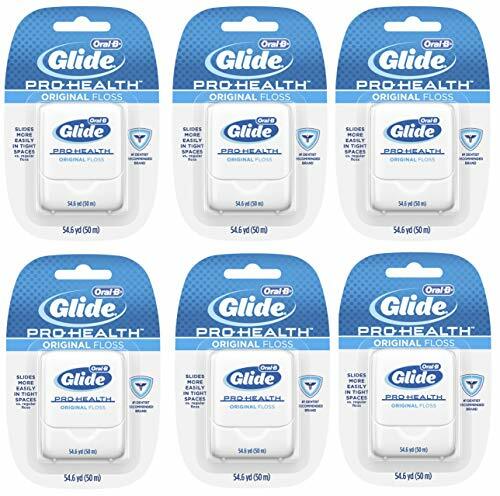 Oral-B Glide Pro-Health Dental Floss scored high marks over the rest of the competition and is our overall top pick. Oral-B dental floss is shred resistant and slides 50% easier over each tooth making it easier to get your teeth super clean. The cool mint flavor is very refreshing and a favorite feature with users. Brushing your teeth every day cleans the surfaces of your teeth but to get your teeth super clean you should have a regular flossing routine in place. Flossing gets the food particles and plaque from between the teeth where brushing can’t reach. Flossing properly every day prevents bacteria from building up that can lead to tooth decay, cavities, and gum disease. Taking care of your teeth the right way, by using a quality dental floss in combined with proper teeth brushing will improve the appearance of your smile as well as prevent the need for expensive dental procedures. Untreated gum disease has even been linked to health risks including diabetes, obesity, and heart disease. To ensure that you are flossing properly you need to have a good quality dental floss from a reputable, trusted brand that knows oral hygiene. We have taken the three top-rated dental floss products and reviewed them in detail below so you can see each one and decide if it is the right dental floss for your needs. We have also provided an informative buying guide that will lead you through the purchase process from determining your specific needs to knowing what to look for in a quality dental floss product. Oral-B Glide dental floss provides users with floss that is strong, resistant to shredding, and smooth so it slides along the surface of the teeth easily as well as the tight spaces in between your teeth. Oral-B is a well-known and trusted name in oral care and this quality dental floss is no exception to the quality products Oral-B is known for. This dental floss slides 50% easier than other types and has a cool mint flavor that users find very refreshing and enjoyable to use. The comfort aspect makes using this product a lot easier on your gums. The material used to make this dental floss is super strong, very smooth, and soft on the gums as well. This dentist recommended dental floss is perfect for you and your family to use to get and keep fresh breath and healthy teeth and gums. Listerine is a very well-known name in the oral hygiene industry, known for their effective and popular line of mouthwash. 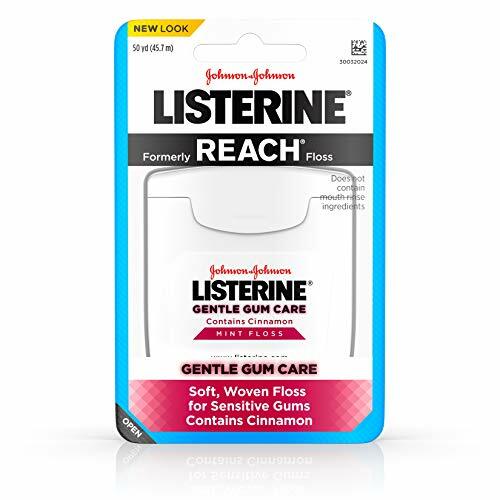 The gentle gum interdental floss by Listerine provides 50 yards of floss with a cushioned design that is perfect for people that have sensitive gums. Gentle Gum care floss has a mint and cinnamon flavor with a springy, soft texture to the floss itself that will effectively remove food particles that get stuck between the teeth. This can lead to bad breath and other problems so it is important to remove these particles on a daily basis. There are no mouthwash ingredients in this floss but the mint flavor of the floss is appealing to users. 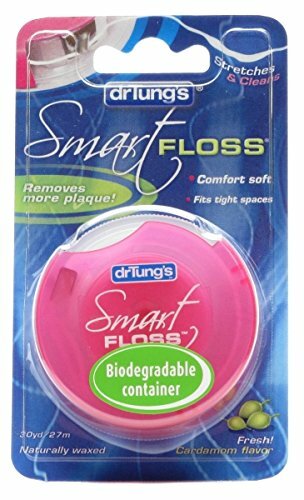 Smartfloss from Dr.Tung is not like other dental floss. It has been clinically proven to get rid of as much as 55% more plaque than other traditional floss does. The texture and thickness of Dr. Tung’s is different than other floss you may have used but you will not have the pain and tenderness that you may have noticed with the others. This unique floss expands when you use it to painlessly get rid of particles in between teeth as well as under the gums. The beeswax coating on the floss allows it to slip easily into the tight spaces that are between your teeth for a clean you may have never experienced especially if you are new to using dental floss. The three top-rated dental floss products we have featured above are all great examples of quality dental floss that will make your oral hygiene routine even more effective. Each of these products has been proven to rid the mouth of bacteria and is easy to use and affordable too. Taking the time to learn what is necessary for a healthier mouth involves having all the needed tools and methods to accomplish that goal. Choosing the right dental floss for your specific needs, preferences, and goals will make the process of finding the right floss much easier to manage by yourself. Once you are ready to purchase dental floss, take a look at the reviews we’ve provided to see if any one of them will be what you’re looking for. If you want to see some other choices, we have listed 7 additional dental floss products that are from reputable companies and that are effective at helping you take care of your teeth and gums. Because there is no one dental floss that is right for every single person, there are many types that have been created. Some people have several different kinds of floss that they use. Finding the perfect dental floss for your specific needs could take a little trial and error but the one thing you always want to ensure is that the choices you are trying are high quality, reputable brands that are known for producing excellent products. The guide below is designed to give you some information about the different kinds of dental floss and what each does. There is also a section on what to look for when shopping and how to go about choosing a dental floss or several kinds of floss for your home. Multifilament Floss – Examples of multifilament floss include silk or nylon floss. This is the most common type, popular with consumers. This type of dental floss has been around pretty much since dental floss was created. Generic dental floss is almost always nylon-based. It is a lot cheaper than the other type and comes in a variety of flavors and thicknesses and can be un-waxed or waxed. Monofilament Floss – single filament made of certain types of plastic, rubber, or PTFE. Monofilament floss is the newest technology in dental floss. Because it is not made of fabric like the multifilament floss is, monofilament floss will not tear or rip. Many people find the single filament floss much easier to use and feel it slides between the teeth. Because of this great feature many brands of single filament dental floss use the word “glide” in their name. Monofilament dental floss also comes in a variety of flavored including mint, bubblegum, and cinnamon and is available in unflavored as well. Monofilament dental floss is available in a variety of thicknesses just like multifilament floss is and is always unwaxed. Nylon (multifilament) floss is available in waxed and unwaxed varieties. The wax is applied to the floss to help make sliding it between the teeth much easier. Most people find waxed floss more comfortable to work with and easier to use. It doesn’t make a difference in how the floss works as both waxed and unwaxed varieties will take care of the food particles equally. Choosing whether to go with waxed or unwaxed is largely a matter of preference and you may not know for sure which one you prefer until you try both. Monofilament dental floss only comes in unwaxed since wax is not needed with this type of floss. There are many different types of dental floss available and finding one that will work for your needs is important so you will use it the way you should. Keep in mind that many people have several different kinds of floss and use more than just one style. Children will have different needs than teens and adults so more than likely, you will have several different types of floss in your medicine cabinet at any given time. Some may like flavored, waxed, unwaxed, or any other number of different options that are out there. The low cost of dental floss makes it very possible to have several kinds of dental floss available for all preferences. Typically, people who travel will keep standard dental floss that fits great in a toiletries bag and keep floss sticks or even an electric flosser for home use. If you don’t know which type of floss will work the best for you and your family, your dentist is always a great resource. We’ve listed a few tips below that you can use when choosing. If you have larger gaps between your teeth a super floss or dental tape could make it much easier to get the particles and works well between these larger gaps. If there is very little space between your teeth a waxed dental floss will slide much easier than unwaxed. Floss sticks and pre-measured strands of floss produce a lot less mess than the floss that is pulled out in long strands and then cut. If you have bridge work or braces you should consider a dental floss that is spongy in texture and get a floss threader as well. Any floss can be used on dental appliances if you have this convenient threader on hand. The ADA seal of approval is more important than the type of dental floss you choose. The American Dental Association is made up of professional dentists in the US that are committed to ethical dental practices, oral health, and progress in science when it comes to oral hygiene and dentistry. This important seal of approval lets consumers know that the dental floss has been checked out by professionals and that it has earned the seal. Plaque can affect anyone regardless of age and cause all kinds of tooth and gum problems if not taken care of properly. Studies have shown that there is no major difference in the ability to remove plaque among the different types of dental flosses. All four of the flosses tested showed improvement in the amount of plaque present when flossing was combined with proper brushing. The electric flosser had the higher plaque reduction average after just one use. Other studies have shown that standard dental floss and electric flossers were both effective to the same degree when it came to removing plaque. Both methods were also deemed safe and did not traumatize the soft and hard tissues of the mouth. There is plenty of research that backs up the fact that electric flossers are just as effective and safe as standard flossing. They are very good choices for elderly adults that may have some dexterity problems with the standard floss. They are also great for kids and teens because they usually like electric toothbrushes and an electric flosser they may see as a fun way to take care of their teeth. Regardless of the type of dental floss you choose there are some things you will want to watch out for once you start using it. If you notice any of the symptoms we have listed below you should contact your dentist right away. Flossing your teeth is an important way to ensure healthy gums and teeth. It should be a part of your regular oral hygiene routine. To get the most from a flossing routine you want to have the best possible dental floss you can find. With all of the choices in types, brands, flavors, and textures available you will be able to find the right dental floss for each member of your family. The three top rated dental floss products we have reviewed above are all terrific examples of quality dental floss products that will help you get your teeth completely clean. A cleaner mouth is a healthier mouth so regularly using dental floss will definitely result in a healthy mouth with healthy gums. The brands of our top three products are reputable companies that are well-known in the oral hygiene industry and are trusted by consumers. Choosing one of these featured dental floss products will get you started on the road to a better feeling, healthier mouth. The information we provided for you in the buying guide will help you understand the differences between the different types of dental floss along with helping you sort through all the different offerings so you eliminate the ones that will not provide what you are looking for. Having the right knowledge is the best way to prevent purchasing dental floss that will not provide what you are looking for. Even though dental floss isn’t tremendously expensive, you don’t want to waste your money. This is why it benefits you to use this guide to provide all the information you will need. Take this helpful information, along with the reviews of the top-rated reviews and confidently search the choices and find the one or ones that will be just right for you and your family.